Walt Eggers lived in the largest upstairs room from 1920 – 1934. It featured an actual closet! Heat was provided by way of the flue that made it’s way up through the floor from the pot belly stove in the store below. After Walt moved away, “Tom’s” son, Homer, then age nine, claimed this room. 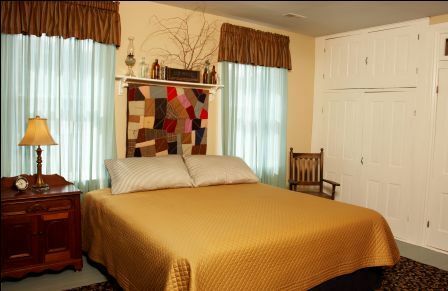 Walt’s room features a king-size bed. The bathroom has an old fashioned claw-foot tub and dresser with basin set to mimic the way a bowl and pitcher arrangement would have provided a way for a person to wash in the morning. Walt’s Room adjoins the Girls’ Room (see below). The door between may stay locked or may be opened if both rooms are reserved together.